We are pleased to announce “Symbiotic Relationships,” the eleventh show in our series at Sightline Institute in downtown Seattle. 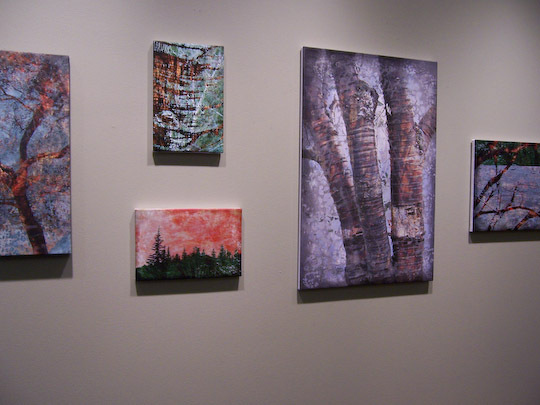 Fall City artist Cynthia Gerdes has nine encaustic paintings on display through the end of April. 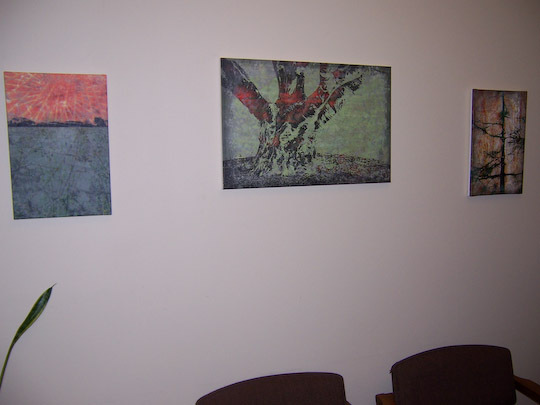 I began encaustic painting in 2008. After years of cruising galleries and attending art shows as a patron, and being strangely attracted to working with sharp objects and fire, I tried my hand at mosaic, welding, glass casting, bronze casting, and watercolor. Then I took an encaustic painting class and was instantly hooked. The four larger works in “Symbiotic Relationships” are part of her “Sundew” series, inspired by the tiny carnivorous sundew plants that she raises in her home. 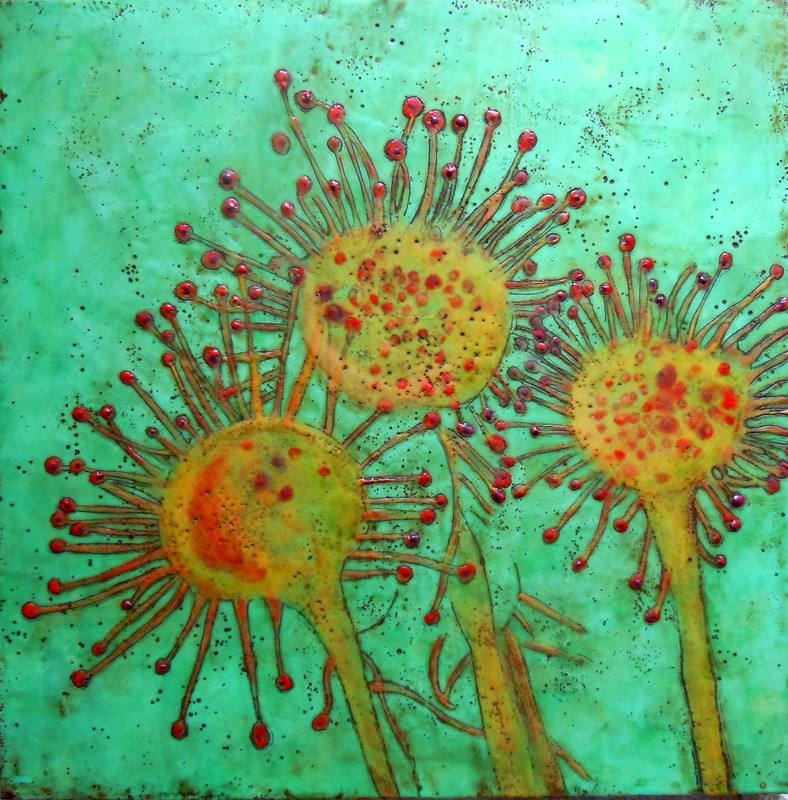 On the walls of Sightline, the light captures the subtle textures and color variations of the wax in her brilliantly colored magnified interpretations of a tiny sundew plant. The five smaller works are part of her “Paris Flower” series, which depicts Paris polyphylla, a flower named for its symmetry and used for its medicinal properties. Cynthia enjoys the creative process, never knowing where it will take her, including finding ways to incorporate found objects into her artwork. A love of both nature as well as order are reflected in her works of flora and fauna, grids and patterns, organic shapes and vivid hues. 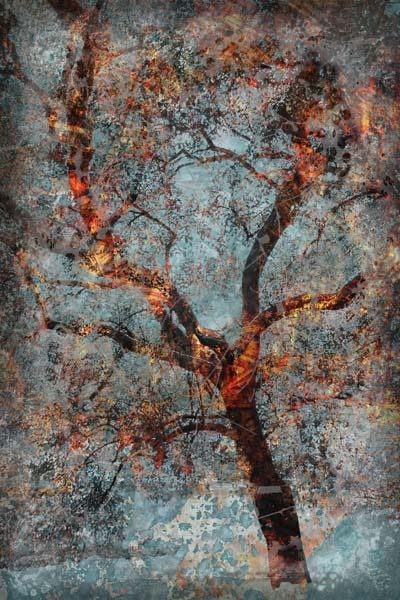 She has shown around the state in both group and solo shows, and her work can be found at UP Front Gallery, part of the artEAST Art Center in downtown Issaquah. 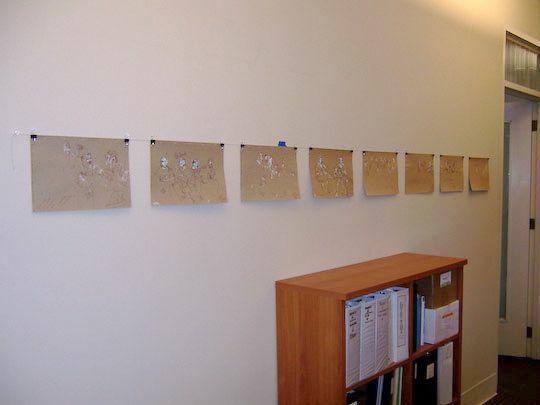 Cynthia recently survived artEAST‘s first 24-Hour Art Marathon, in which she created four encaustic paintings on-site in a period of 24 hours. 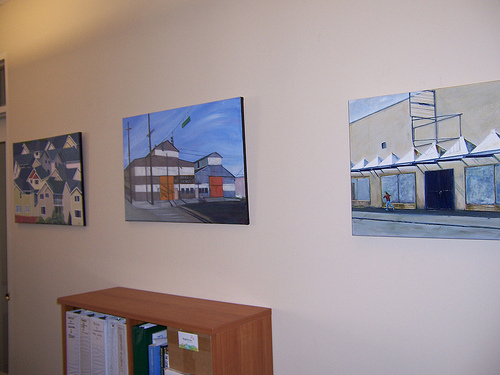 All four were sold in the auction following the marathon. 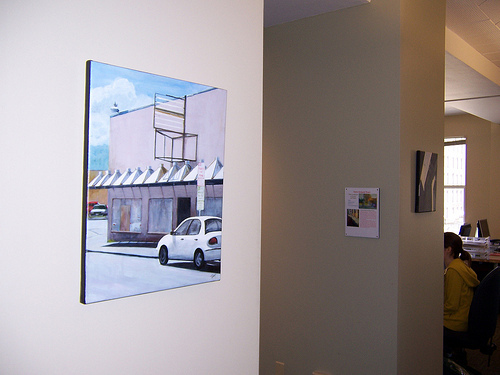 To view Cynthia’s artwork at Sightline during March and April, visit the office between 10am and 3pm on weekdays. All works are available for purchase. Contact Cynthia directly at fallcitywax (at) comcast (dot) net with sales inquiries. 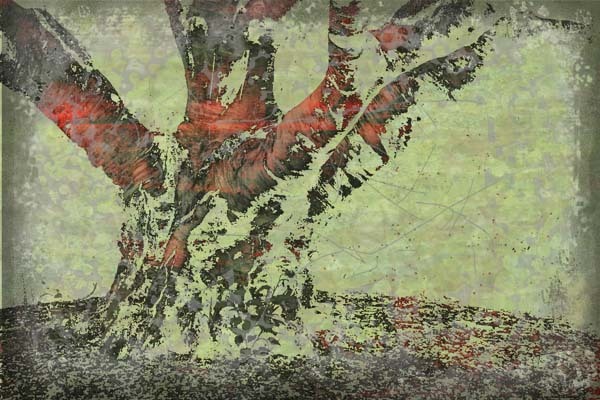 What thoughts about sustainability are inspired by Cynthia’s art (and by art in general)? Share yours in a comment. I have discovered that I listen better while drawing and draw better while listening. 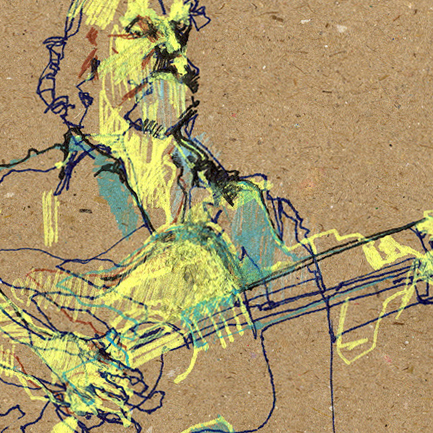 The most interesting thing about drawing musicians is that they move. Rather than trying to draw impressions quickly, I draw deliberately using a modified blind contour line, often adding detail to faces . . . 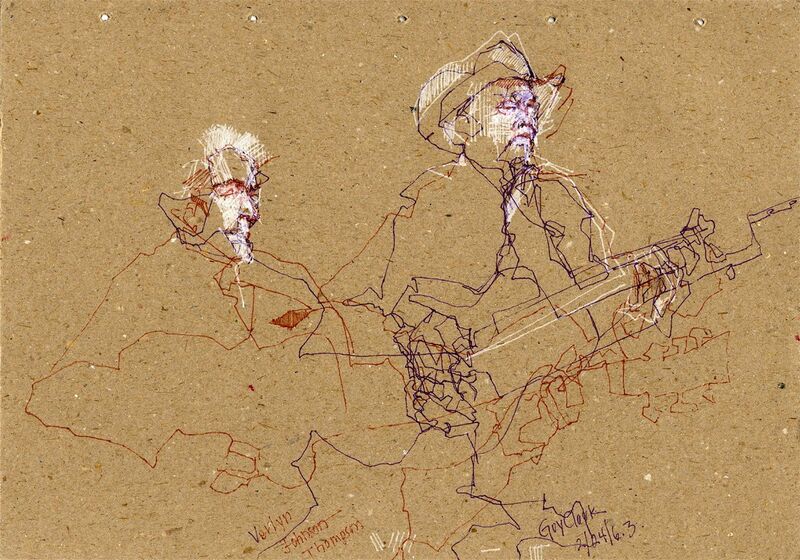 I often capture multiple superimposed views, giving the drawing dimensionality and dynamism. 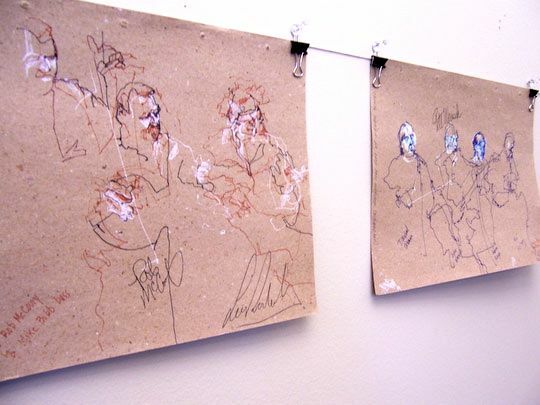 In this body of work, Ellen juxtaposes the natural brown paper with the modern-day gel pen, which she likes because “the ink is saturated, and [she] can get strong lights on toned paper.” The results are drawings full of movement and energy. Though both Ellen’s academic and occupational backgrounds are in computer science, she has been drawing most of her life. 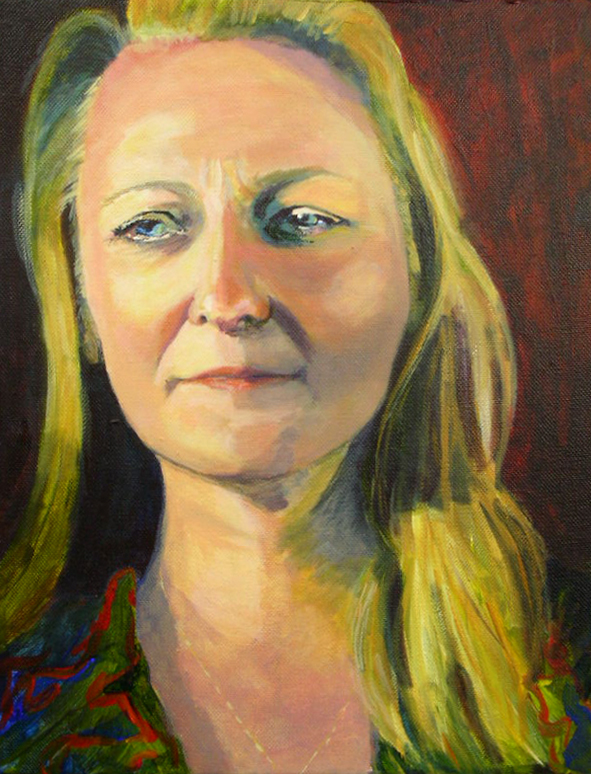 Most of her work is figurative and based on observation. An active member of artEAST, Issaquah’s non-profit arts organization, she and fellow member Gretchen Van Dyke, have curated figure drawing shows the past four years, including one where participating artists drew from a model on the walls of the gallery. Ellen will also be facilitating open studio figure drawing sessions there, as well as teaching an expressive figure drawing class. For the past five years, she has also had her work included in Unclad: The Fine Art of the Figure, an annual international juried art show at Gallery by the Bay in Stanwood, Washington. 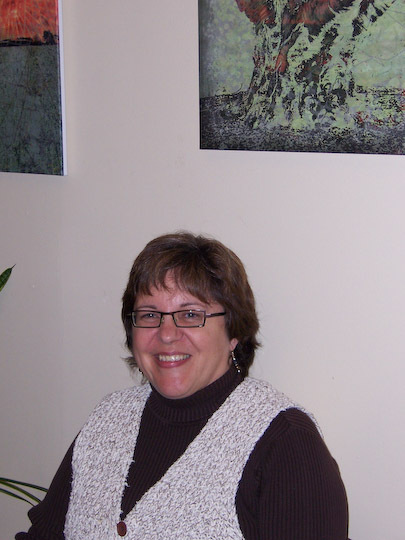 ﻿Formerly from Pittsburgh, Pennsylvania, Ellen currently resides in Issaquah with her husband and cats. See cat drawings here. 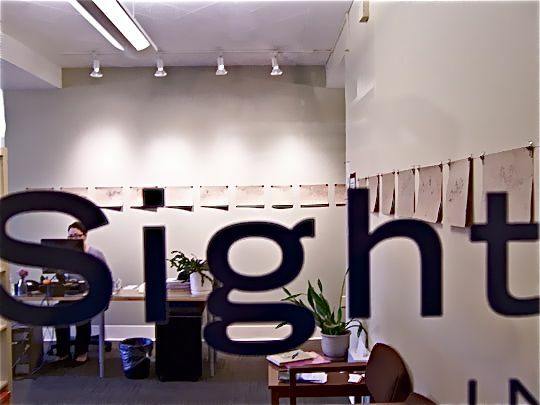 To view Ellen’s lines (literally) of line drawings at Sightline during January and February, visit the office between 10am and 3pm on weekdays. All works are available for purchase. Contact Ellen directly at ellen.borison (at) gmail (dot) com with sales inquiries. What thoughts about sustainability are inspired by Ellen’s art (and by art in general)? Share yours in a comment. 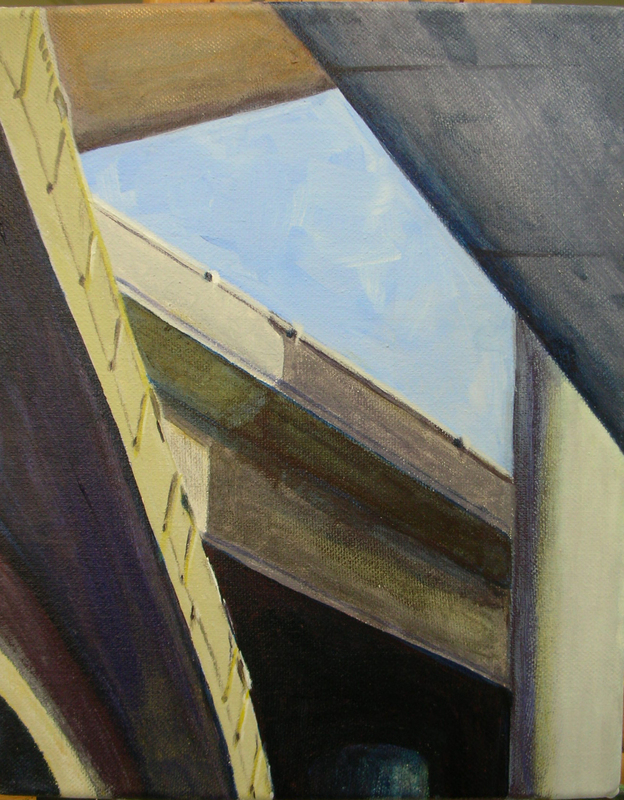 Now on display in Sightline Institute‘s downtown office until the end of October is the exhibit “State of the Urban Landscape,” a series of 17 acrylic paintings by Terry Sargent Peart. 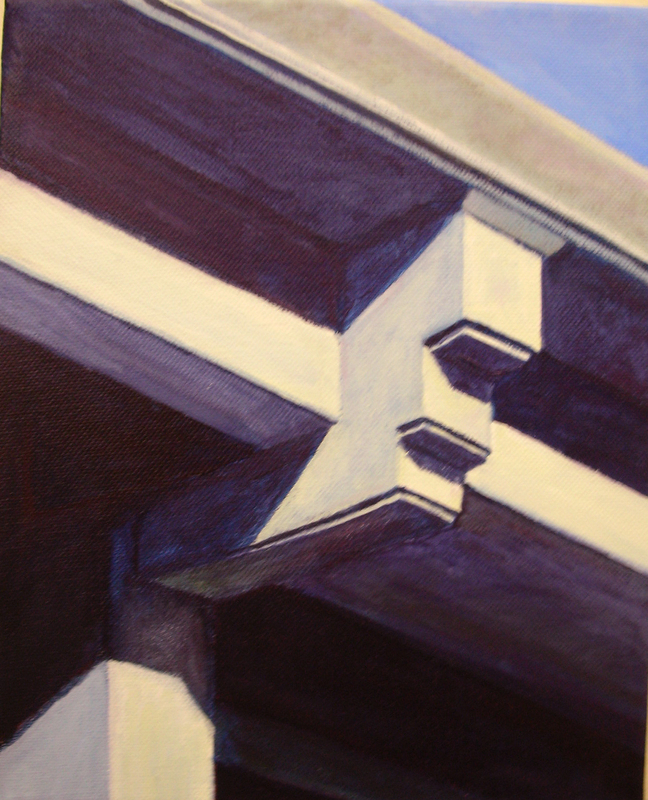 From vacant buildings to freeway buttresses, many of Terry’s subjects are views we may wish to ignore or deny. With her strength in line, color, and depth of field, she forces us to look, and ultimately see beauty in these structures. Terry constantly carries a sketchbook and camera with her, never knowing when inspiration will strike, whether it’s catching moments in coffee shops through gesture drawings, creating sophisticated figure drawings, or doodling that becomes future experiments in paint, fabric, and/or printing. Yes, not only does Terry paint and draw, but she makes prints on her own full-size printing press, dyes her own fabric, and makes quilts! 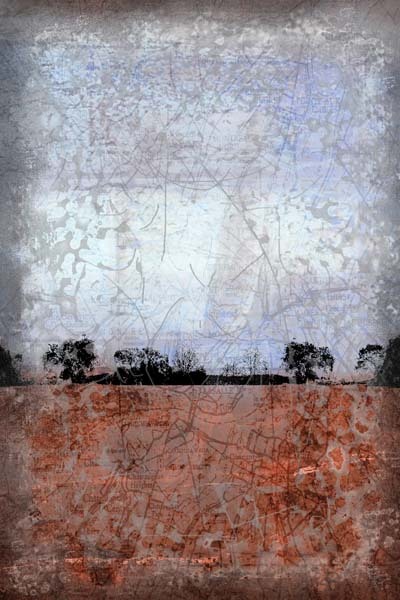 Recently she has started to combine her media interests into unique mixed-media pieces. Follow these pursuits on her blog. A recent post describes the process of dyeing fabric with blackberries. Terry currently lives in West Seattle with her husband, furnituremaker Darrell Peart, and their Jack Russell terrier. 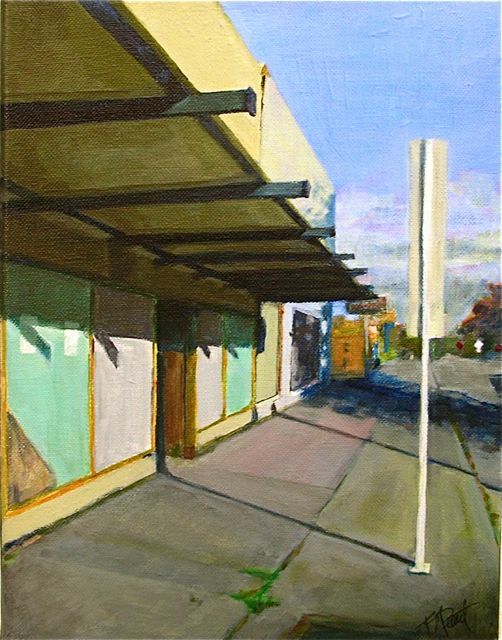 Though she often explores urbanity in her artwork, Terry, like most native Washingtonians, savors the natural wonders of the area. Walking her dog and bicycling give her many opportunities to do so. 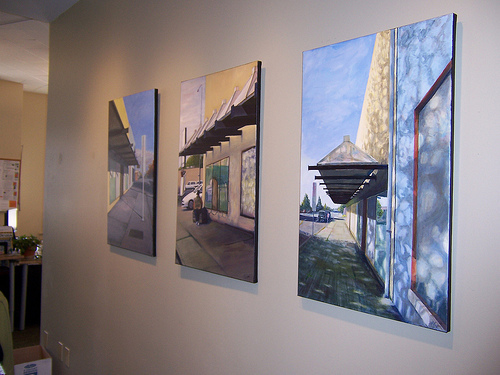 To view her art at Sightline, visit the office between 10am and 3pm on weekdays through the end of October. 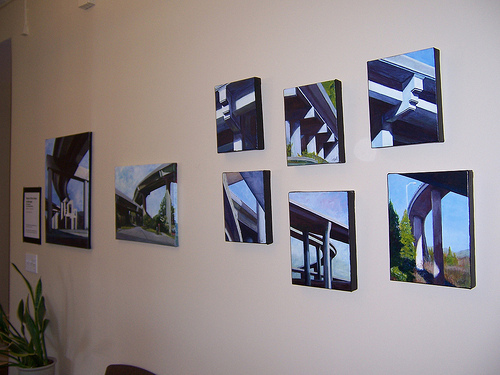 All but one of the works are available for purchase. Contact Terry directly at peart (at) comcast (dot) net with sales inquiries. What thoughts about sustainability are inspired by Terry’s art (and by art in general)? Share yours in a comment.